Okay, I've changed my mind. I'm not ready to shut down this blog. There really is something else to talk about. For the past several months I've been working on one vent-related project: My book. I started writing this book about ten years ago. My goal was a book with wall-to-wall coverage of not only technique, but marketing, the business, the offstage creative processes, equipment, and so on. Not just another book about how to talk without moving your lips. 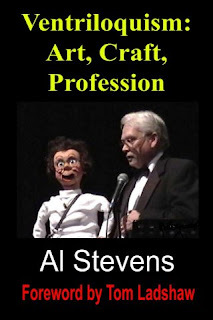 Eventually, however, I realized that ventriloquism as an entertainment art form was in a decline. Interest in it was not what it had been. This realization was reinforced in 2006 when Clinton and Adelia Detweiler closed the doors on the Maher Ventriloquist Studios, an iconic business that had served the art for as long as I could remember. I asked Clinton about his decision, and he told me that the level of business had dropped off such that it would not support the endeavor. I put my book project on hold at that time. Then, something happened. Seemingly all at once. Jeff Dunham's work started to catch on big time. Terry Fator won America's Got Talent. Dave Letterman featured not one, but two special "ventriloquist weeks." Clinton kicked off an online version of his business. Ventriloquism was rising from the ashes and the public was aware. And there was another major development not related to ventriloquism. "Publish on demand" (POD) became a new model for print edition book publishing. Originally I had wondered whether I could interest a publisher in my book, given its relatively small potential marketplace. At that time an author wishing to self-publish had one avenue--the vanity press. You paid a publishing house to produce your book, and you sold it, hopefully, out of the trunk of your car. With the advent of digital publishing (as opposed to typesetting), books can now be printed one at a time. It no longer requires a minimum number of copies in the 100s to justify a print run. They print books as they are ordered. The other obstacle to self-publishing was finding sales outlets. The bookstores are not interested in self-published books. There was no formal outlet for such a book. That has changed, too. With POD, your self-published book, good or bad, is listed on amazon.com, the leading online bookstore. So, given all that, I decided to resuscitate my vent book project. The manuscript needed a lot of update to reflect changes taking place in the industry. Not to mention all the unfinished chapters. I got a lot of help from Tom Ladshaw, ventriloquism's acknowledged reigning expert and entrepreneur. Tom proofread the first draft, submitted countless corrections and suggestions and wrote a foreword. Yesterday, I got the book finished and uploaded to the POD publisher. Copies will be available on amazon as soon as I receive and approve the proof copy. Tom will have copies for sale at his dealer's table at this year's ConVENTion in July. I hope to make it there, too, in which case we'll have a book signing one afternoon. Keep watching this blog for announcements about the book and a link to the amazon listing.